Welcome back to the new semester:) I hope you’ve all had an amazing and relaxing break and are now ready to start this semester strong. As a new year comes around, we often tend to set some new goals that can usually improve our resumes as well as teach us new skills. With that being said, as I was walking around the Takoma Park Campus last week I noticed that there were some flyers on the walls regarding a program offered at the school and I felt the need to share it with you guys. 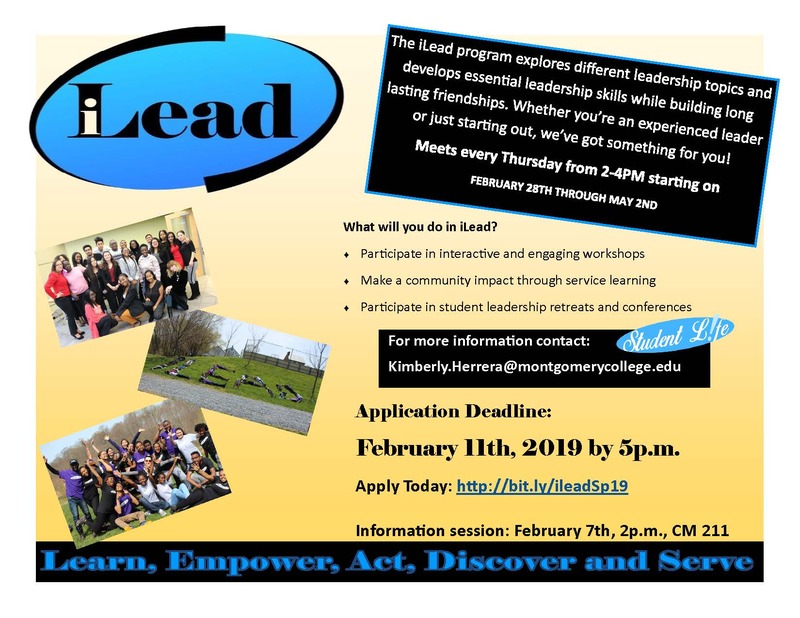 The program is called iLead Leadership Program and they are currently accepting new applications. This semester-long program is great because it’s designed specifically for Montgomery College students! This program is a great opportunity if you’re interested in gaining leadership skills, meeting new people, and participating in student leadership retreats. I am sure that there are many of you out there who are looking for something to do outside of classes while at the same time teach you new things, so I invite you to check out the flyer here. The deadline is still one week away so don’t miss out on this great opportunity to be part of a program that also meets at the school’s main campus. Also, make sure that you are committed to assisting the meetings because it plays a big part in the program. Don’t forget to have fun and enjoy the activities you’ll get to do as part of the program. And lastly when you get accepted, congratulations from me!! I hope many of you take advantage of this opportunity and I look forward to reading down in the comments of those interested in applying. I hope all of this information is useful and serves you well in the future! Let’s get this week started on the right foot and have an extraordinary week raptors.